Although the perception of a beautiful cheek varies among different cultures, most consider a full cheek with distinct projection of the upper portion cheek and slight hollowing of the mid cheek to be attractive. Emptiness or hollowing, especially in the upper inner cheek can make even a young person look tired, sad or unhealthy. Some lucky people are born with prominent, full cheeks; others are not. But even those with full cheeks in their youth will lose some of their fullness as they age. Structural fat grafting can replace and restore full or well defined cheeks for those who have lost it, and improve the shape of the face for those who have never had full or prominent cheekbones. Filling out the cheeks also can give the appearance of “lifting” the face without a facelift. LipoStructure can also be used to reverse the damage caused by chronic acne scarring, reconstruct the cheek, minimize the appearance of bulging eyes, and disguise or soften the appearance of silicone cheek implants. Two years after placement of very thin layer of concentrated fat under the skin of the eyelid and upper cheek. Note the remarkable flattening of wrinkles. 18 months after placement of an extremely thin layer of concentrated fat immediately under the skin of these dark circles. Note the lightening of the dark circles in both the upper and lower eyelids. 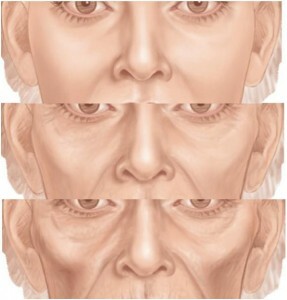 The lower eyelids are one of the most common sites for fat transfer. The lower lid/tear trough area often becomes dark and hollow with age. Placing a thin layer of fat carefully into this delicate area can make someone look younger and less tired. Many dark-skinned individuals have dark shadows even in early youth, and placing a layer of fat below the skin can lighten the area significantly. Because the skin here is so delicate, and there are many tiny blood vessels, this area often bruises quite a bit, and one must be patient during recovery for bruising and discoloration to gradually fade. 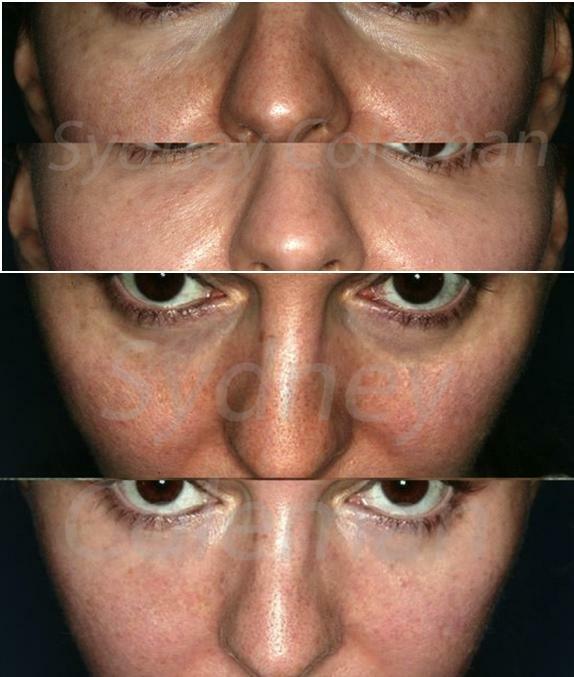 Patient before (above) with deep tear troughs, dark pigmentation and deep pores after a lower eyelid blepharoplasty. 14months after one fat grafting, her lower eyelids are lightened with even pigmentation; smoother skin and remarkably smaller pores. Before (above) and 10 months after (below) a thin layer of fat grafts to the lower lids. Please note the remarkable improvement in texture, color and pore size of the skin. 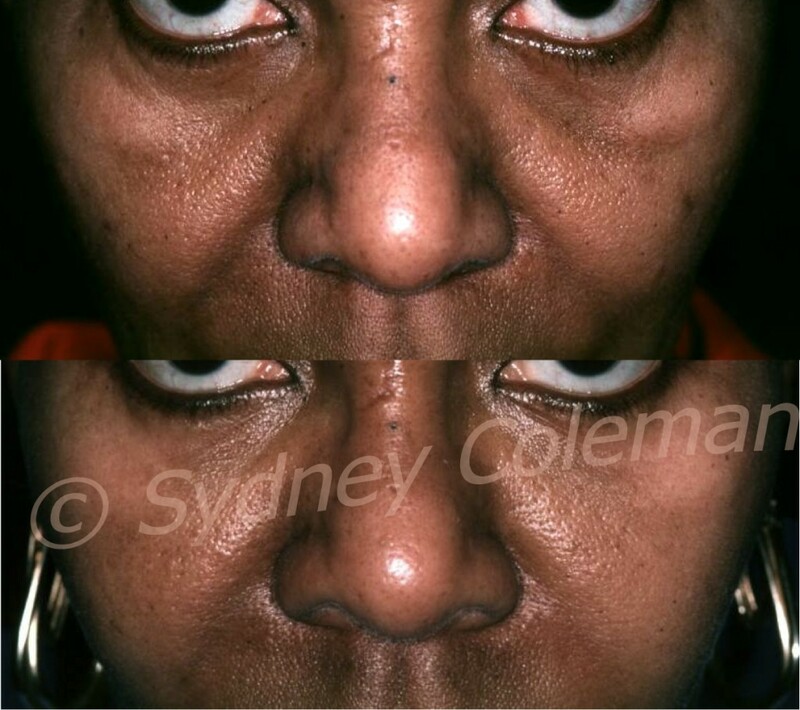 This 42-year-old woman presented with remarkable lower eyelid “bags” and atrophy of the area between her eyebrows (left). 3 years and 9 months after one fat grafting session, she looks much healthier. 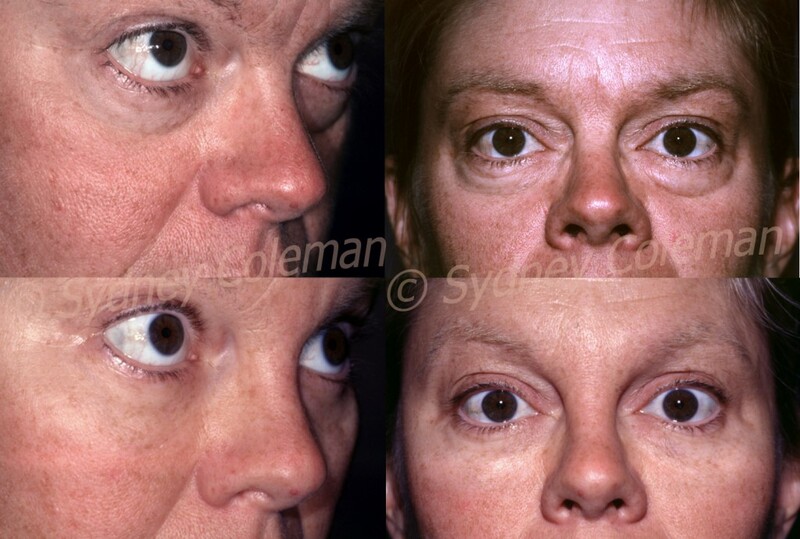 Structural fat on the cheek below the lower eyelid “bags” created an aesthetically appealing transition from the lower eyelid to the uppercheek. 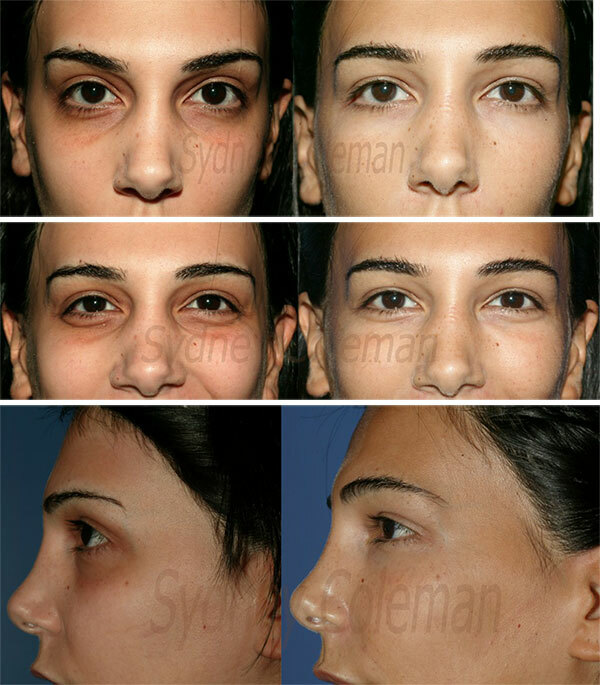 In addition, there is a dramatic change in the quality of her lower eyelid and cheek skin with diminished fine lines, improvement in color and a decrease in the size of her pores. 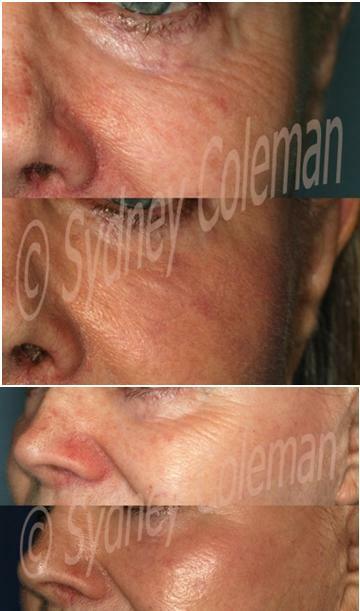 The pores in the before photos were not only deeper, but they were lining up to form wrinkles. The fullness from the fat grafts breaks up the lines of pores. The area between her brows is much calmer now that the deep vertical wrinkles have been softened.